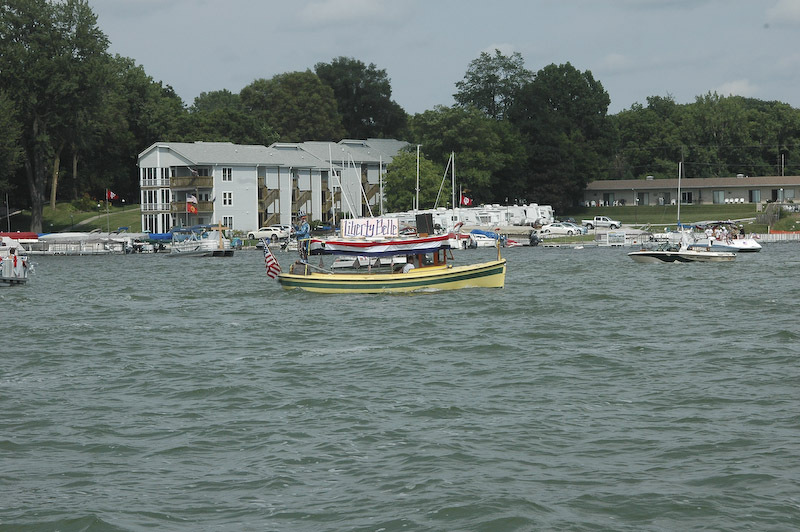 Light drizzle caused a little concern 45 minutes before the Wawasee Flotilla as did the 85 percent chance of thunderstorms heading straight for the lake on Saturday, but the rain and storms held off and the annual Flotilla was underway under cloudy skies. Women of Today’s entry, “Agony of Defeat” with four “Time” magazine covers was the Commodore’s choice as the top entry. The judges had to spend the entire parade deliberating which entry stood above the others for the remainder of the prizes as all entries were said to be among the best in years. 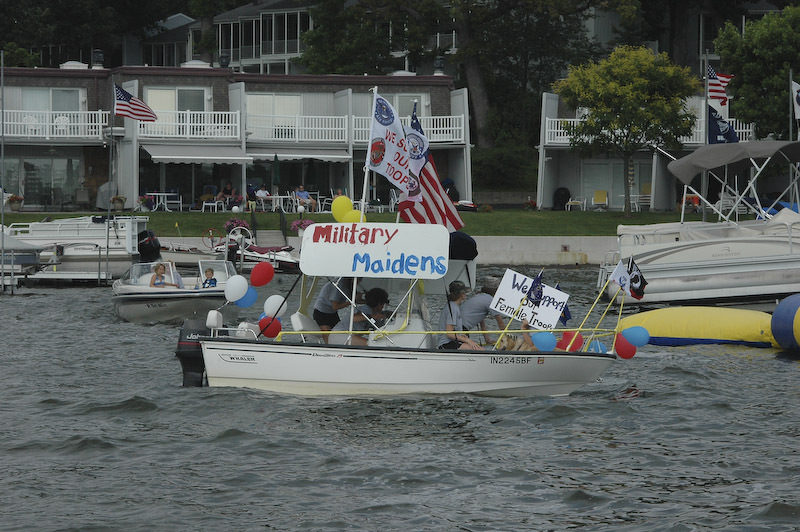 Many of those entered had never participated in the flotilla before. 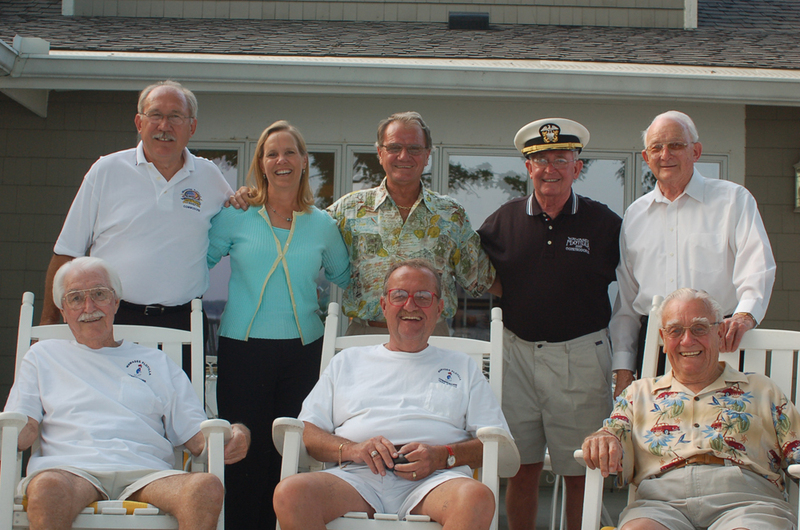 The “Indiana Sports” entry won the Wawasee Property Owners Association award, entered by Jerry, Marilyn and Sydney Hollensbe, Pier 630, and the Hojnack/Huntzinger entry from Pier 434Q won the DNR award. Winning the Neighborhood award was the entry of Brian Eckrich, Pier 749, with their Blackhawk entry. Wawasee High School’s “20 Sports, 1 Team” won the Best Lake Wawasee History. The IU Student Painters entry by Brad Miller won first in commercial/business with a Cubs entry taking second. The most original entry was won by Pat and Kathy Jones with their “Take Me Out To The Ball Game” theme. The McNary family’s entry of USA Olympics in honor of Ted Rogers, former Commodore and committee member, won Most Patriotic. Scott Abbs’ entry of the Highland Games won the non-profit award. The antique and wooden boat judges had just as hard of time choosing the best antique and best wooden entries. There were a total of nine wooden/antique boats entered this year. Jim Donahoe’s 1940 17-foot ChrisCraft was chosen the winner of the antique division with Jan Appenzeller’s Skiff the winner of the wooden boat division. The committee will be deciding the theme for the 2014 Flotilla and date in the near future.